sebaceous gland, as we have already discussed. The oily liquid produced by the sebaceous gland is known as sebum. 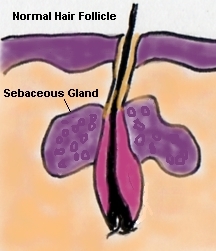 The sebaceous glands remain relatively small during infancy and childhood. At puberty due to the action of hormones known as androgens (which include testosterone and dihydrotestosterone), increase the size and activity of the glands. As a result, there is increased sebum production from the sebaceous glands. A bacteria known as Propionibacterium acnes(P.acnes), which is a normal resident of the hair follicle and which thrives on a fatty food, increases in number during puberty due to the increased ‘food supply’ in the form of sebum! 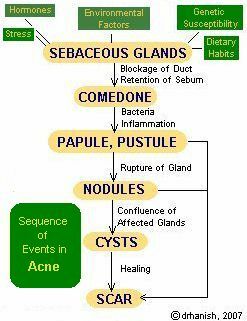 The combined effects of activities of the increased sebum secretion and the P.acnes is the cause for the disease we commonly recognise as acne. Let us examine how these two conspire together to disturb the normal milieu interior of the skin and damage the clear complexion of millions of teenagers around the globe. 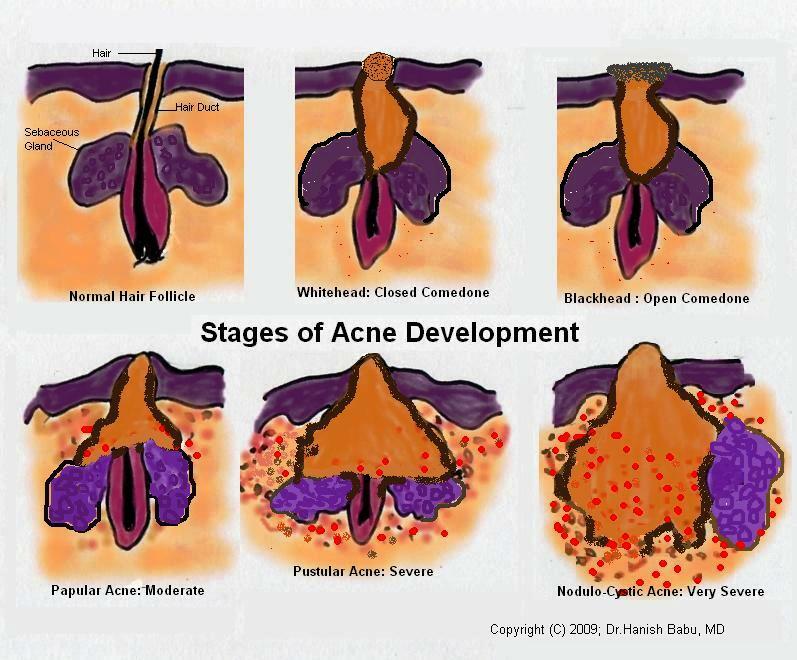 Depending upon severity, there are 4 types of acne. We have already seen that the combined effects of activities of the increased sebum secretion and the bacteria Propionibacterium acnes(P.acnes) is the cause for acne. Certain enzymes produced by the bacteria cause chemical changes in the composition of sebum, converting the triglycerides into free fatty acids. These free fatty acids are potentially irritating to the epidermal cells lining the inside of the hair follicle. Some chemotactic factors are also released due to the action of the P.acnes on the sebum. These in turn attract certain white blood cells known as neutrophils to the vicinity of the hair follicle. This starts another chain of chemical and physiological reactions that results in what we know as inflammation. The lining of the hair follicle above the sebaceous gland become thickened. 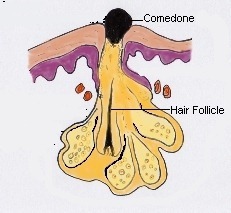 Because of changes in the keratinization of the follicular cells, there is accumulation of abnormal cornified cells inside the follicular lumen. 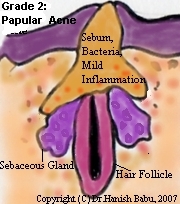 This sticky cells become adherent to the top of the sebaceous gland to form a plug known as microcomedone. When this plug enlarges just beneath the small hair follicle(pore) opening on the surface of the skin, it become visible to our eyes. This is nothing but the (in)famous whitehead or the closed comedone! An open comedone or blackhead occurs when, because of the pressure from the plug beneath, the hair orifice enlarge to reveal the black “dirty looking” plug. This black color is not due to dirt, but due to the action of atmospheric oxygen on the free fatty acids, the after products of sebum. This, then, is how the comedones come into existence during puberty. Some comedones are not as innocuous as they look. For many unfortunate teens, they are time bombs ticking, with impending catastrophe in later years to break into scar forming nodules and cysts. As the sebum continues to accumulate, the hair follicular wall become stretched and larger skin colored papules become evident on the skin surface. There is minimal inflammatory reaction due to the neutrophils attracted to the area in this moderate type of papular acne. 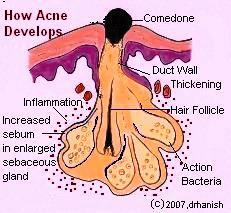 The lesions are more pronounced and more in number than in the comedonal acne. 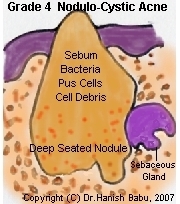 When the sebum secretion is increased and the chemical breakdown of the sebum occurs due to the action of the bacteria P.acnes, neutrophils are attracted to the area. Neutrophils are the white cells involved in inflammatory reaction. These release certain chemical mediators and enzymes which further weaken the follicular walls. The wall and the sheath of the sebaceous gland thins and become inflamed leading to pustule formation. These are numerous red, tender, pus filled lesions on the affected areas. 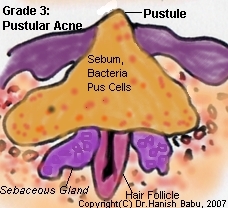 This is the severe grade 3 acne or pustular acne. When the follicular walls further weaken and get inflamed gradually the walls expand and become deep seated nodules. Further action of inflammatory mediators cause rupture of the wall and sebum, part of the wall and cornified cells and bacteria are released into the dermis. This causes an intense reaction known as foreign body reaction within the dermis resulting in the formation of deep seated cysts. This is known as the very severe scarring type of nodulocystic variety of acne. Note: The grading is only facilitatory. There may be more than one or two kinds of lesions (comedone, papule, pustule, nodule) present at any time in acne patients. The grading is done when a particular type of lesion out numbers others. should be made or treatment undertaken without first consulting your doctor. If you do so, the author or the website will not be responsible for any consequences. The images provided are for illustration purpose only and are copyrighted.